Throughout this DVD I explore and show you how to sew Drunkard’s Path blocks, Apple core, Flowering Snowballs, Clam shells, Improv Curves and even ovals. It’s a very thorough look at different types of curves and my tips and tricks for handling them. I take you through cutting, pinning, piecing, sewing, ironing and combing shapes together…to ultimately showing a finished product for each. There are lots of project ideas to inspire you. I know that a lot of people are intimidated by curves and I think after you watch this, you will have a great deal of insight into what is easy and what is tricky. And I have no doubt that you will want to start a curved shape of your own in one manner or another. 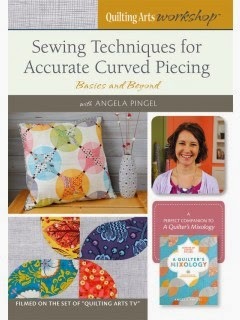 This is a technique based workshop DVD and my goal in making it, is to make the task of sewing curves feel approachable and exciting. I want to take any mystery out of the process and make sewing curves that much more accessible. The reality is that often we need to SEE someone creating to understand how they do it rather than just read about it or try to follow diagrams in a book. It is now available for download or hard copy purchase from Interweave.